If you are flying into Chicago, you have a choice of O'Hare, Midway, or Gary/Chicago airports. Just about every commercial airline has flights to Chicago O'Hare Airport. O'Hare is a full service airport, that has a variety of concession stands, ground transportation options and car rental agencies. O'Hare was voted the "Best Airport in North America" by readers of Business Traveler International for seven consecutive years. Finding cheap flights to Chicago involves a bit of planning. Depending on where you live, it may be challenging, but not impossible. When searching for cheap flights to Chicago, keep in mind that since O'Hare is the major airport, it might be the best place to find cheapest flights to Chicago. A few commercial airlines, such as Delta, Continental, Frontier, Southwest and American have flights to Chicago Midway Airport. 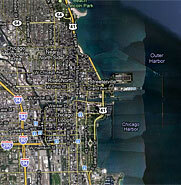 Midway Airport is conveniently located 10 miles from downtown Chicago. In order to find the cheapest flights to Chicago, be sure to book your ticket well in advance. Most people visit Chicago in the summer or fall. Summer offers a vast selection of special events and outdoor activities. However, you will be dealing with the biggest crowds, periods of hot, muggy weather and probably the most expensive flights to Chicago. Autumn is usually a sunny season in Chicago. The crowds at major tourist attractions begin to grow thinner. Cheap Flights to Chicago may be easier to find during this season. Since snow is not an issue until late November, you may be able to find the cheapest flights to Chicago at the earlier part of the month. If your top priority is seeing Chicago's indoor cultural sights, winter may be a good time to find cheap flights to Chicago. There are no lines at the museums and other attractions, and hotel rates may be cheaper. Although the city may be windy in the winter, Chicago is not much colder than other North American locations. If you are looking for a car rental, Avis, Alamo, Budget, National, Herz and Enterprise all have rental agencies at O'Hare. Once in Chicago, be sure to take a walk on Michigan Avenue, visit the Willis Tower, Grant Park and other exciting Chicago attractions. If you are looking for a Chicago travel package, consider the Go Chicago card. This great value provides discounts at selected hotels, as well as admission to over 25 Chicago attractions.